In a previous article here, I discussed Cisco Meeting Server Load Balancing with a focus on the Cisco Unified Communications Manager configuration and load balancing from its perspective. This article expands that discussion with the Call Bridge Group feature added in CMS version 2.1. Note this article does not cover all the requirements of implementation, please refer to the official Cisco documentation that I have referenced below. Also, note that Load Balancing Calls Across Cisco Meeting Servers omits configuration required to make the solution work. Specifically, it does not discuss the CMS trunk Rerouting Calling Search Space configuration which is necessary for Call Bridge Groups to work correctly. Within CUCM, the following configuration is required, noting the two bolded items are specifically needed to facilitate Call Bridge Group operations. Configure normal call routing logic, e.g. Route Groups & Lists, SIP and Route Patterns etc. To create the Call Bridge Group, issue a POST request on one of the Cisco Meeting Servers to /api/v1/callBridgeGroups with the desired name parameter name=xyz. The returned GUID will be used in the next step to add individual call bridges to the group. The resulting Call Bridge Group object. To add call bridges to the call bridge group issue a GET request on one of the Cisco Meeting Servers to /api/v1/callBridges. Note the GUIDs for the call bridges that will be added to the call bridge group. For each call bridge that will be added issue a PUT request on of the Cisco Meeting Servers for each of them to /api/v1/callBridges/<Call Bridge GUID> with the parameter callBridgeGroup=<Call Bridge Group GUID>. Repeat this for each call bridge that will be added to the group. Specifically, configure the Load Limit value for each call bridge. Refer to the official Cisco documentation during planning to determine an appropriate load limit value for the type of call bridge in use, for example, at the time of writing a VM based Cisco Meeting Server uses x*1250 where 'x' refers to the number of vCPUs. Also, it is possible to fine-tune the load balancing through the newConferenceLoadLimitBasisPoints and existingConferenceLoadLimitBasisPoints parameters noted below, details sourced from the official Cisco documentation. newConferenceLoadLimitBasisPoints – a numeric value for the basis points (1 in 10,000) of the load limit at which incoming calls to non-active conferences will be disfavored, ranges from 0 to 10000, defaults to 5000 (50% load). Value is scaled relative to LoadLimit. existingConferenceLoadLimitBasisPoints – a numeric value for the basis points of the load limit at which incoming calls to this Call Bridge will be rejected, ranges from 0 to 10000, defaults to 8000 (80% load). Value is scaled relative to LoadLimit. For each call bridge issue a PUT request to /api/v1/system/configuration/cluster with the desired loadLimit=xyz parameter (and additional fine-tuning parameters if desired). 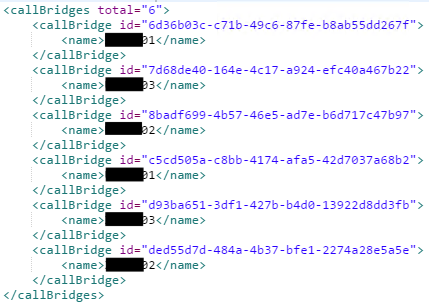 Once the load limits have been defined for the call bridge groups, issue a PUT request to /api/v1/callBridgeGroups/<Call Bridge Group GUID> with the parameter loadBalancingEnabled=true. Note there are additional parameters for load balancing of outgoing calls etc., I won't go into their details in this article please refer to the official Cisco documentation. At this point load balancing of calls within the call bridge groups should now be working. When the call bridges receive a SIP INVITE, they decide between the nodes in the group if the call should be rerouted to an alternate call bridge. If outcome is to reroute the call, the chosen call bridge will send a SIP INVITE with the Replaces Header, example below. If the Rerouting Calling Search Space is not correctly configured on the CMS SIP Trunks then the following can be observed in the CUCM traces. 32206222.002 |11:18:20.540 |AppInfo |Digit Analysis: Host Address=10.1.1.66 MATCHES this node's IPv4 address. 32206222.004 |11:18:20.540 |AppInfo |Digit Analysis: Host Address=10.1.1.66 DOES NOT MATCH top level org domain. Jun 25 13:54:32 user.info xms01 host:server: INFO : call 52: outgoing SIP call to "[email protected]" from space "Test VMR"